Denis was born in 1995 in Maryina Horka, Belarus. He started his piano studies at the age of seven, in the local music school with Professor Valentina Shetsko. In 2004 he was accepted to the Republican Akhremchik Upper School-College of Arts, into the class of the eminent piano teacher, Honoured Teacher of Belarus, Tatiana Sergievskaya. 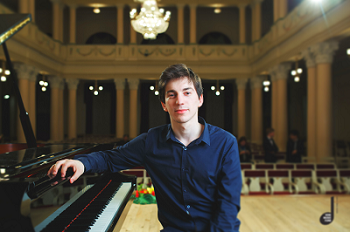 There Denis’s accomplishments soon stepped beyond the school curriculum, as he succeeded in several junior piano competitions, among which is the Fifth Youth Delphic Games of the CIS Member States (Minsk, 2008), where he won the Silver Medal; and International competition Music of Hope (Gomel, 2009), where he got the First Prize. Still at school, Denis got under the tutorship of the Honoured Man of Art of Belarus Professor Vladimir Nekhaenko, who had been his professor till 2017, including his studies at Belarusian State Academy of Music. His piano contest track record also includes the following achievements: Second Prize at the International ‘’Alemdar Karamanov Competition’’ (Simferopol, 2011), First Prize at the Seventh International Competition for Young Pianists in S. Prokofiev’s Native Land (Donetsk, 2013), Golden Medal (First Prize) in the senior age group at the eleventh Delphic Games of the CIS Member States (2016), Fifth Prize in the Senior group at the International Competition for Young Pianists in Memory of Vladimir Horowitz (Kiev, 2017) and 1st Prize and Audience Prize on the Cittá du Cantú 28th International Piano and Orchestra Competition ( Italy,2018). Besides playing as a solo performer, Denis has a significant part of his music career stand for being an accompanier and a chamber musician. In 2016 as a part of a trio, he won the First Prize at Stankovich International Competition in Kyiv. Denis Linnik has a dynamic concert schedule that includes solo recitals, playing with symphonic and chamber orchestras, participation in festivals and master-classes in Belarus, France, Germany, Ukraine, the Netherlands, Norway, Poland, Russia, Spain, Italy, Finland, Switzerland and the USA. He also performed on Belarusian and Ukrainian radio and television and became the title character of one of the episodes of the documentary series about talented youth ‘We are tomorrow’ by Belarusian national TV network. Three times (2009, 2011, 2014) Denis was awarded the main scholarship of the Belarus President’s Special Fund for the Support of the Talented Youth. You can hear Denis on his YouTube channel. If you are interested in working with Denis, please get in touch with the EMCY Office. L. van Beethoven, Piano Sonata No. 27 e-moll (op.90) 1 mov. L. van Beethoven, Piano Trio in E-flat major (Op.1 No 1) – 1 mov. F. Chopin, Piano Trio in G minor (op.8) – 1 mov. R. Schumann, Piano Quintet in E-flat major (op.44) – 1 mov.